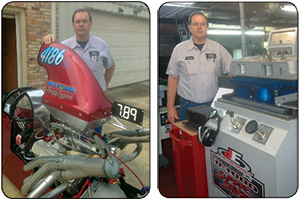 Chuck Spanel of Spanel Racing Engines loves his new ProUltrasonic 3624 cleaner !! Customer Credentials: These guys definitely have successful representation in the NHRA Drag Race Series. Josh Vettel won Division V Top Sportsman Championship and Dave Bogner, son of past World Champion Marlin Bogner (both are employed at Star-Lite), had a second place finish in the Division V NHRA Superstock category. 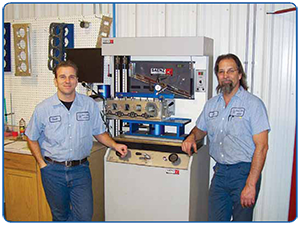 Testimonial: "Since the addition of our Saenz Flowbench our customer base has grown. We are now able to provide a complete head service to our customer for all their needs. "The Hines Dominator was the best investment our company could have ever made. We have balanced over 3000 crankshafts in the last 7 years, all trouble free with great repeatability." "The Saenz flow bench was a great investment. We quickly learned how to perfect our port work, optimize our performance valve jobs and which valves work best with which heads for optimum flow. 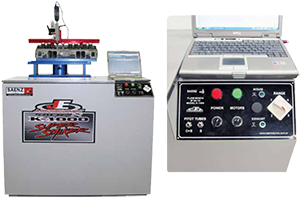 If you're building race winning engines, a flow bench is mandatory." "With the market changing and everybody always lookig to be on top the Rottler ATC is the machine to do the job with precision machining and faster turn around. It definitely helps not only our customers but ourselves become Champions. Being perfect is everything and the RottlerATC puts out nothing but perfect!" M&M Competition Engines not only assembles record setting combinations from the drag strip to Bonneville, but we also manufacture the components that set these records. To set records you need record setting equipment and our Saenz Digital 680 bench is no exception. It has been instrumental in the development of all our cylinder heads and intake manifolds. From our high end billet "Revolution" cylinder head to our cast tunnel ram intake manifolds, we could not have done it without our Saenz Digital 680. Galto Racing Enterprises specializes in cylinder head & intake manifold development for a variety of racing applications. We provide CNC cylinder heads & manifolds for all forms of racing including, drag race, circle track, marine and imports. We provide confidential private label work as well as design "one off" custom heads and manifolds. Our Saenz D-680 flow bench has great capacity and functionality allowing us to take advantage of available technology to further develop our cylinder heads & manifolds. Flow tests are done faster on the D-680 allowing us to get the results quickly, making multiple tests of small changes more efficient. The added featurse of the Audi Tech software combined with the D-680 has allowed us to further advance our port development and tailor each head and manifold combination to our customers specific needs. "The Saenz flow bench has made flow testing heads a real pleasure. With the different brand of bench that I was using before it was very time consuming. Now with the Flo Pro software on the Saenz bench I have cut my time in half and I can offer my customers triple the information than before. The folks at Jamison have been great and helpful with the training and support on the Saenz flow bench. I would buy a Saenz flow bench and any other equipment from Jamison in a heartbeat, they are really fine folks." My name is Nick Smithberg owner of Smithberg Racing Cylinder Heads & Manifolds. 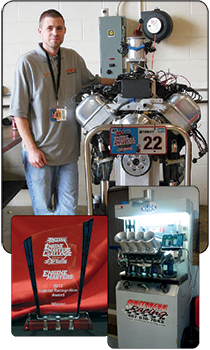 Our team "Hot Heads" recently competed in the 2012 Engine Master Challenge in Lima, Ohio. We finished Runner-Up in the Street Class, got the "Torque Monster" Award (in Street Class for most tq/ci), and got an Editor's Choice Special Recognition Award for a VERY unique Early Hemi! With well over 300 hours invested in my unique induction package I couldn't have done it without the use of my Saenz S-600 flow bench! With over 6 years of use, it has worked flawlessly - Quality piece of equipment and a happy customer!